September 10, 2018 Alumni, Nursing & Health Sciences, Physician Assistant, Students Comments are disabled after 182 days. 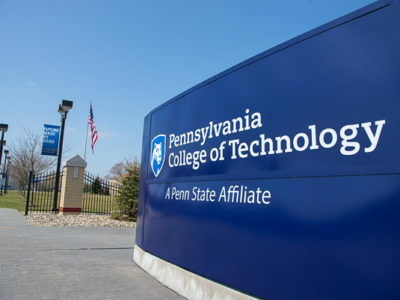 Pennsylvania College of Technology’s 2018 surgical technology graduates passed the national Certified Surgical Technologist Examination on their first attempt with a 91.67 percent pass rate, which far exceeds the national average. The group of 12 graduated in August and took the exam the same month. Penn College student Anna G. Thompson, of Mount Carmel, practices assisting with a laparoscopic surgery in the college’s mock operating room. Over 91 percent of the college’s August surgical technology graduates passed the national certification exam for surgical technologists on their first attempt. Penn College offers an associate degree in surgical technology, which can be continued to a bachelor’s degree in applied health studies: surgical technology concentration. The bachelor’s degree courses are available online. The college’s five-year pass rate for first-time test takers of the Certified Surgical Technologist exam exceeds the national average. To learn more about the surgical technology program at Penn College, call 570-327-4519.